A pharmaceutical benefactor (Proctor & Gamble) repeatedly refused to provide raw data including randomization codes to academic "collaborators". Codes were required by the academics to interpret data they had generated. The academics were unable to verify statistical analyses, meeting abstracts, one published paper and two draft publications "ghost written" in their names. Study data was provided to authors 3 years later (in early 2006) following press exposure. "Fair" analysis of the data would not have yielded findings desired by the sponsor. There were multifaceted and intriguing attempts to prevent the problem from being raised or discussed. This entry summarizes another of the many noteworthy excuses for refusal of access to data. 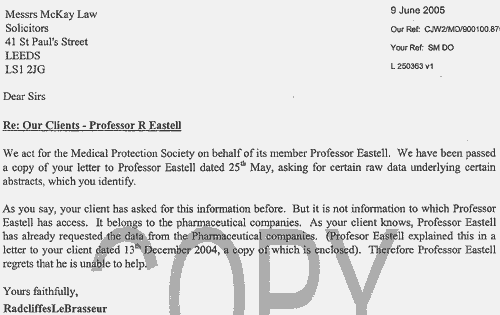 On May 25 2005 McKay LAW wrote to Professor Richard Eastell. Eastell was the supposed author of the first of three intended P&G publications related to the work. He was senior author on meeting abstracts (1,2) and two related draft publications intended for submission. 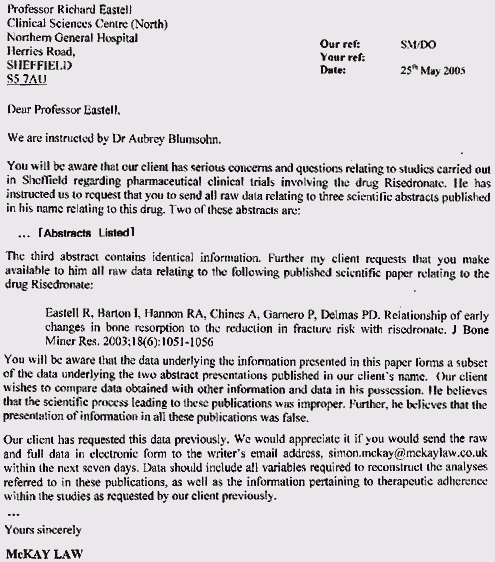 The legal letter requested raw data underlying the abstracts and the two related draft publications which were "on the table". It also requested data underlying Eastell's previous publication based on a subset of the same data. The reply received from Eastell's legal representative is below: It reiterated that he too had requested the data and had been refused. It justified the denial of data on the basis that "It belongs to the pharmaceutical companies". See original copies of letter and reply in Acrobat format. This ignores the difference between supposed ownership and access. It ignores that the Inability of an author to supply raw data would constitute prime facie evidence of research misconduct. It ignores the explicit conditions of submission to any respectable medical journal. It ignores that statements had already been made to a journal confirming full access to data (see appendix to JBMR 2003 18(6) 1051-6 and BBC broadcast ). There does seem to be a good deal of misunderstanding about honesty in authorship here. A GMC referral should be made.